What is it about the Santa Clause that gets me all misty eyed? Well it’s probably because much like Jack Frost I saw this film with my father when it first arrived in theaters. 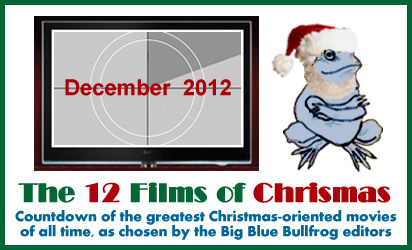 Furthermore unlike Jack Frost this film doesn’t show you a family that is ideal and perfect. The mother and father are broken up and the mother is remarried. The father, Scott Calvin, (played by Tim Allen) is a bit lost in his house without a wife as is evident in the opening of the film when he takes his son out to eat for Christmas Eve dinner because of botching the cooking. He also has a comedic dislike of his wife’s new husband Dr. Neal Miller (played by Judge Reinhold). Of course things take a turn for the yuletide when Santa Claus falls off the roof of Scott Calvin’s house. When Scott puts on the suit he becomes the new Santa Claus because of the ‘Santa Clause’. Scott and his son Charlie (played by Eric Lloyd) are then whisked off to the North Pole where they are informed of Scott’s new role. Unfortunately they wake up the next day believing it was all a dream. Of course Scott soon begins to transform into the image of Santa. His former wife and Dr. Miller than begin to worry that something is wrong with Scott as he cannot help looking and acting like Santa. As a result they take away his rights to see his son Charlie. The movie although mostly a simple happy story has some very emotional moments when Scott loses his custody of Charlie. 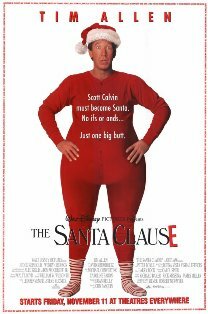 The Santa Clause is probably the film that belongs the most to the 90’s generation of kids. I was 3 when it came out in a theater which was exactly the perfect age to see a film like this. The childlike nature of the elves is done wonderfully although the head Elf (played by David Krumholtz) is a bit more sarcastic and serious. There are so many good things about this film I can’t list them all. Tim Allen was a favorite actor of mine as I watched Home Improvement for as long as I can remember. There are some great scenes involving elves with attitude; although yeah they are a bit campy in retrospect. I don’t really acknowledge the sequels although I hear they aren’t bad and I think it’s really cool that my brothers who are six years younger than me got to see the second Santa Clause film when they were fairly young just like me. I guess it really just comes down to the fact that this film is really inseparable from Christmas for me. I can’t imagine a Christmas where I don’t get to see it at least once for a short time.